So yesterday I said that we wanted to try something different for breakfast instead of our same usual pancakes. Well we also wanted to have something different for dinner instead of the usual, I make it every week, dinner. Hands up if you love potatoes. Right, me too! I also love twice baked potatoes but they take so long. Which means I have to somehow remember to put them on well in advance of the rest of dinner. How many times do I remember to do that? Yeah, not many. 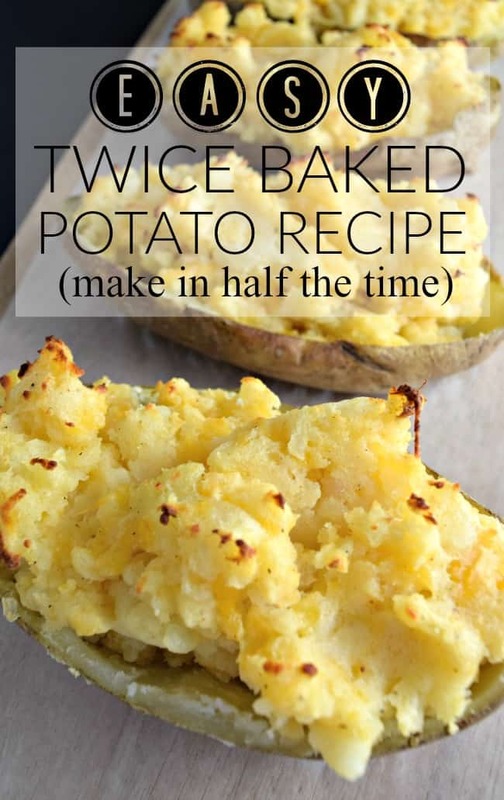 So, this weekend we decided to fix a easy twice baked potato recipe in half the time. They turned out so good and we had leftovers for lunch the next day too. Toppings – Use anything that you love on your potatoes. We fixed ours like we make mashed potatoes but added a few extras too. First you want to preheat your oven to 350 degrees. 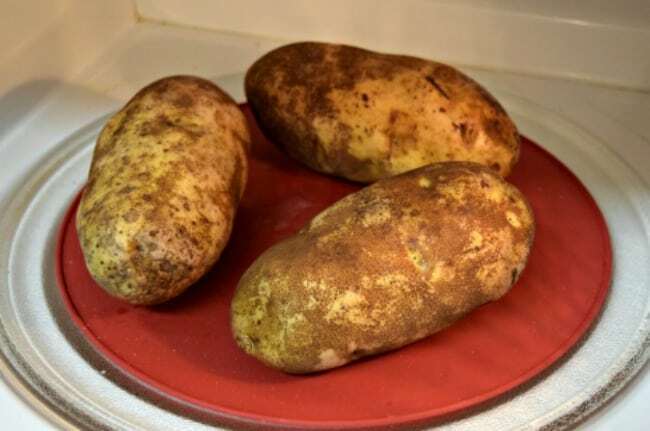 While the oven is preheating cook your potatoes in the microwave. This is what cuts the time in half. Normally a twice baked potato is baked twice in the oven. 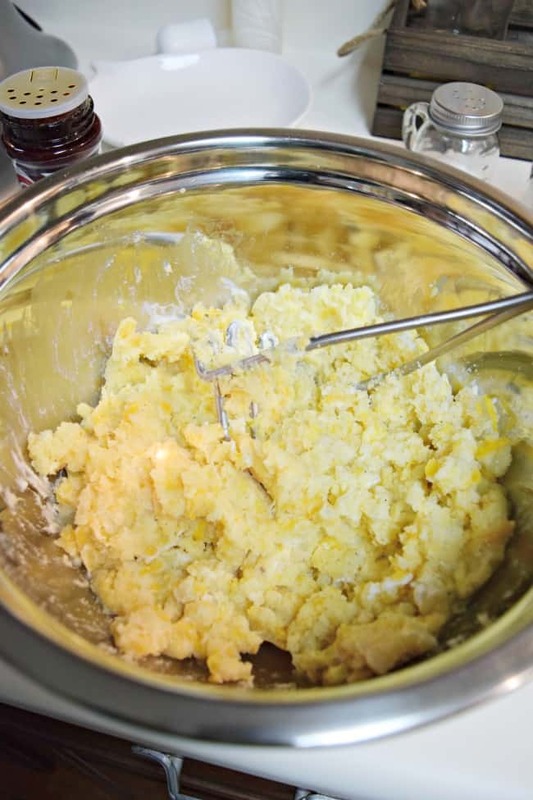 The first baking of the potato takes approximately 1 hr and 15 minutes. That doesn’t even count the time to scoop out the insides, mix the toppings, rescoop and bake again. By the time a normal twice baked potato is finished you have nearly 2 hours invested. All for a small side dish! Can you see why they don’t get fixed much? So by cooking the potatoes initially in the microwave you cut out a LOT of time. It took about 15ish minutes to cook 3 potatoes in the microwave. Once the potatoes are fully cooked through you can cut them in half and begin scooping them out. Be careful not to over scoop otherwise you will mess up your potato bowl. Which if you do it’s no big deal. You could actually throw this all in a casserole dish and bake it again. 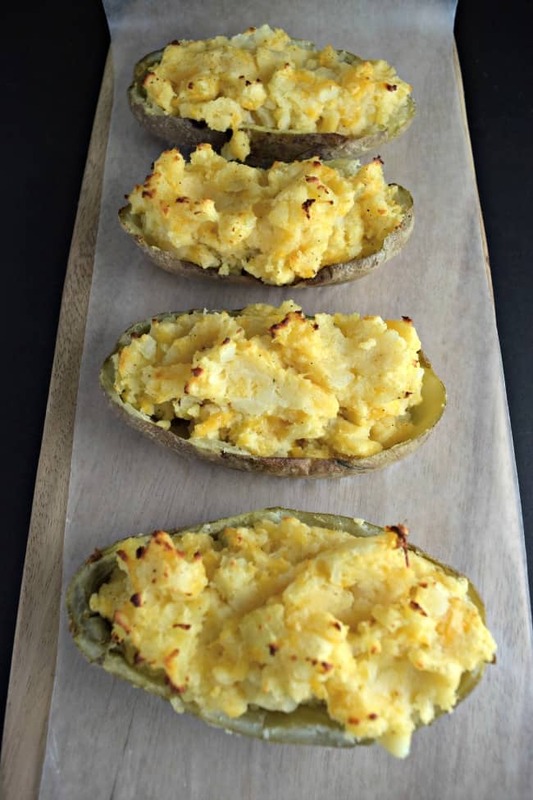 It doesn’t have to go bake in the potato skins but that is just traditional style twice baked potatoes. Now is the best part, mashing the potatoes and mixing together all the yummy toppings. You can add in whatever you like on your potatoes. The sky’s the limit. We like to add in cheese, butter, seasoned salt, pepper and sour cream. I don’t have exact measurements because I never exact measure mashed potatoes. I add a little, taste and add more of whatever it needs. 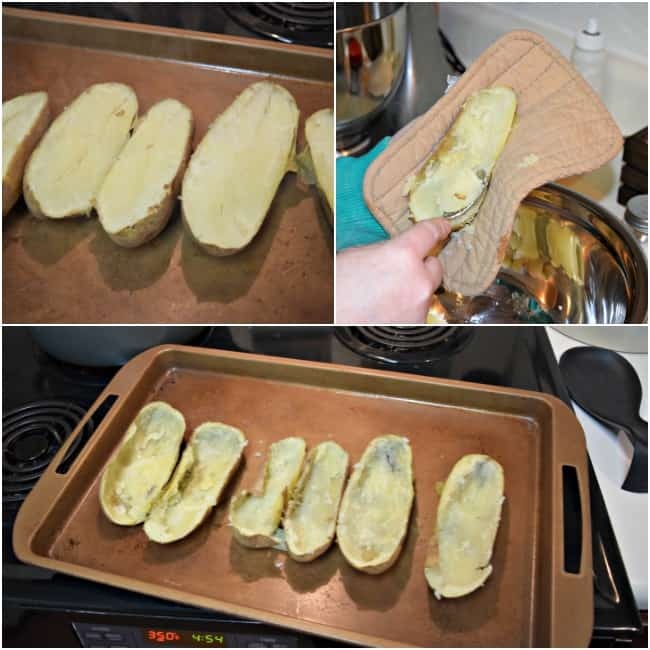 Add the potatoes back into your skins (or a dish) and heat in the oven for 15 – 20 minutes. The tops will get golden brown when they are ready. 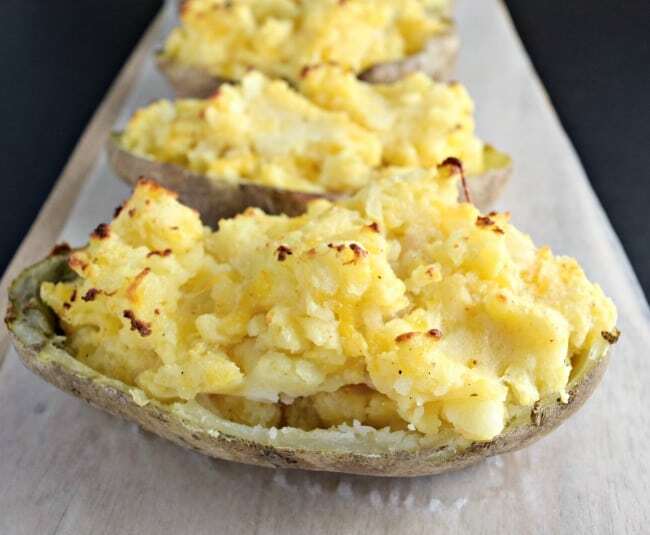 In total it takes about 45 minutes to cook this easy twice baked potato recipe. Still a little time consuming for a side dish but much faster than the 2 hour version. Plus, it doesn’t taste any different. 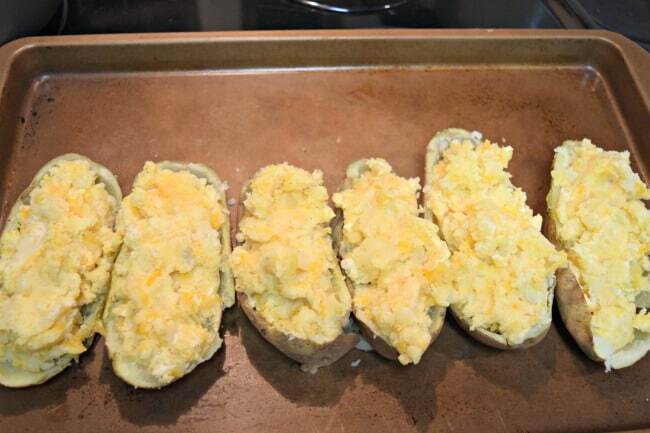 Let me know if you have ever tried twice baked potatoes made this way. Super easy right?